Day in and day out, coaches focus on developing effective practice sessions and better game strategies. Players need to improve their skills, and there are an infinite number of new drills to try. But there is more to coaching than the daily tasks. For a team to be consistently successful, it has to master elements beyond physical skills. Players have to learn how to focus and be mentally sharp. As a licensed psychologist with specific competency in sports and performance, Dr. Chris Carr has dedicated his career to advancing mental training in athletics. His work extends beyond any single sport, and he has partnered with a variety of high-level programs, including the Indiana Pacers, U.S. Olympic teams, Purdue University, Butler University, and Central Michigan University. Since 2006, he has served as Coordinator for Sport and Performance Psychology at St. Vincent Sports Performance in Indianapolis. The first step he takes when boosting a team’s mental strength is educating players and coaches on its significance. He does this by posing a question: How much do they feel their sport is mental, on a scale from zero to 100? Before athletes answer the question, Carr breaks down the three Cs of mental training: confidence, composure, and concentration. “I’m not looking for a right answer, I’m just asking them to be introspective,” he says. Most athletes and coaches rank their sport as 70 to 90 percent mental. Carr then asks a second question: Of the mistakes you make, what percent are mental? Once again, responses usually range between 70 and 90 percent, with athletes at elite levels attributing almost all their mistakes to lapses in focus. That leads to a third question: If your sport is 70 to 90 percent mental and your mistakes are 70 to 90 percent mental, what percent of your training and practice time do you spend doing mental training? After asking that is when athletes and coaches truly begin to understand how much they have neglected the mental aspects of athletics. Dr. Carr’s philosophy is that there are a foundation of mental skills that fall into four basic categories: goal setting; energy management skills; composure, focus, and concentration skills; and pre-performance mental routines. Coaches then have to devise a plan for improving their team in all of them. “For example, in terms of goal setting, as coaches develop practice plans, they should ask themselves, What do they want to accomplish that week? We know they want to go win their matches but what do they need to do first in order for that to happen? What are the process goals that they really have to work on in terms of technical skills and tactical skills?” says Carr. Energy management involves recognizing when your team becomes tired and starts to lack concentration, which is addressed through composure and focus exercises. “Do you help them focus on the right things at the right time? 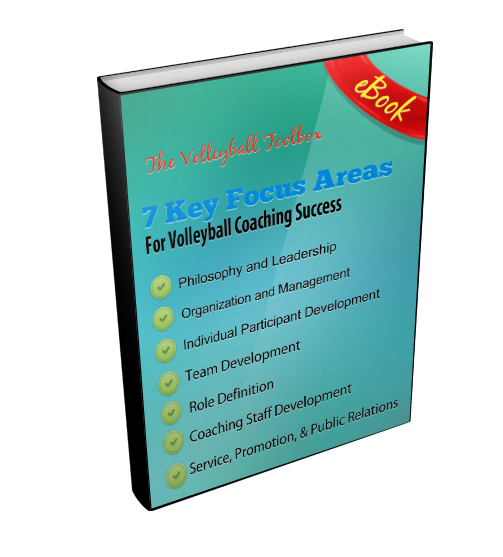 Are you coaching by focusing on specific relevant cues? Are you employing a ‘do this’ mentality, instead of a ‘don’t do that’ approach, which tends to focus athletes on the wrong things?” says Carr. Pre-performance routines are all about creating a regimen that consistently prepares athletes for competition. “How do you get your focus to stay in the moment? How do you manage adversity? Do you have specific routines during timeouts so you can communicate effectively?” says Carr. It is important for coaches who want to implement mental training with their team to form a comprehensive plan that will remain in place throughout offseason training and the ups and downs of the regular season. Carr suggests that coaches utilize the services of a sports psychologist, when possible. This can be accomplished by reaching out to governing bodies, the U.S. Olympic Committee, and campus or local resources.